Home » Asia » Exploring Vietnam » Mui Ne, Vietnam: Resort to it. 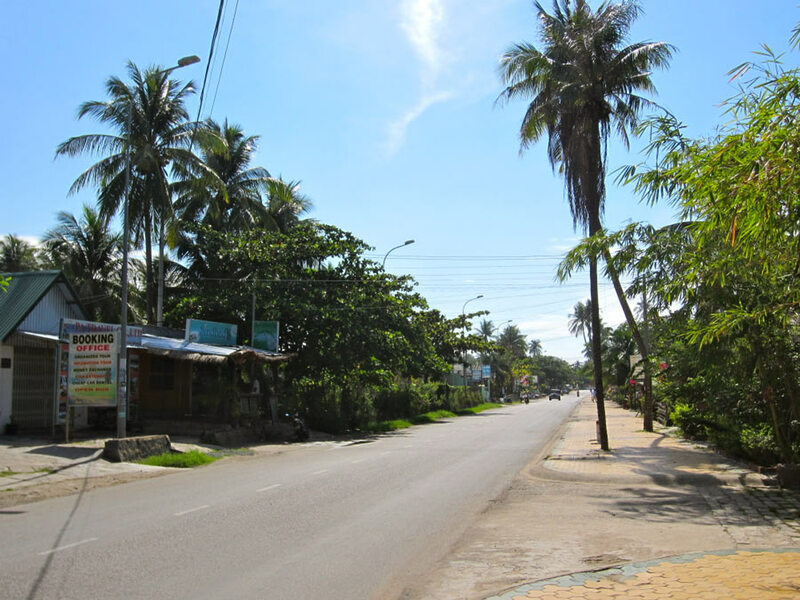 The main street in Mui Ne – Nguyen Dinh Chieu. We arrived in Mui Ne about five hours later and were dropped off very close to the resort that we wanted to stay at: Bien Nho Resort. Our room (310,000d/$14.90) was bright and clean with no less than two balconies — one with a partial sea view. 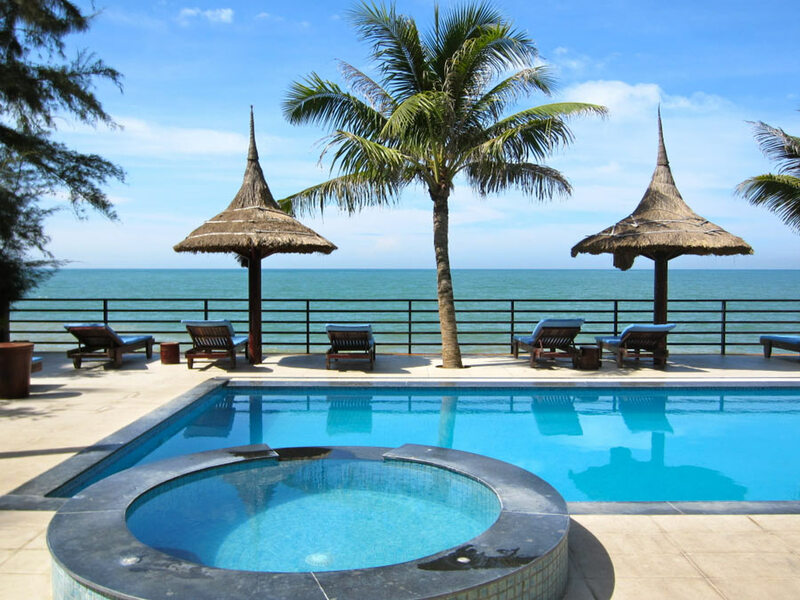 It’s a beautiful hotel with a swimming pool that overlooks the choppy South China Sea. In the late evening and early morning there was a bit of a beach but during the day, when the tide was in, the waves crashed against a concrete wall, splashing the salty water up to the pool deck. It was cool to have a front row seat to the ocean’s power. The next two days were spent hanging out by the pool and filling our bellies with seafood and other yummies, the most delicious being a curry tofu hot-pot from Bien Nho’s attached restaurant. We could have rented a moto and driven out to see the giant sand dunes but we were too enamored by the lure of the pool and jacuzzi to venture the 20 km. Jacuzzi, pool, palm tree, ocean. Pop pop! 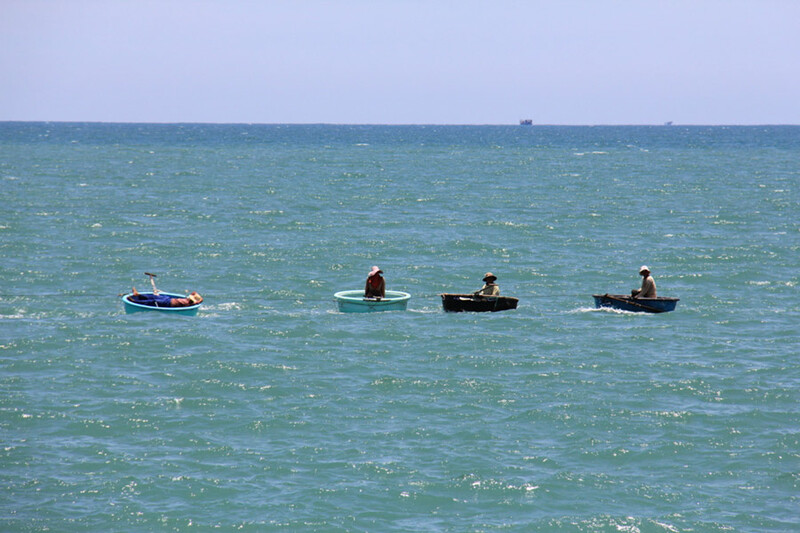 We waved goodbye to the waves and headed to Ho Chi Minh City. Mui Ne has a way of making a person lazy. Maybe it’s the sound of the waves crashing into the soft-sand shore. Perhaps it’s the comfy loungers that overlook the sparkling waters of the pool. At any rate, it took a lot of effort to get out and see some sights. The last time we went to Mui Ne (see story above), we didn’t do anything. This time, we vowed to get out there and see what this 15 kilometer strip of beach town had to offer. What we found, may have changed our lives forever… but probably not. This trip marked our one year anniversary of living in Vietnam, so to celebrate we booked a nice resort complete with pool, beach, an amazing breakfast, a pool table, and some other barely used amenities. Phu Hai Resort is a little bit out of town. If you want to go anywhere you’ll have to take a taxi or rent a bike. We chose the latter and made a deal with a place immediately outside of the resort’s gates. After a tiny bit of negotiation, we got a Yamaha Nouvo for 4 days at the cost of 350,000 VND ($15.55). The main advantage of staying out of town is the quietness. The main strip in Mui Ne is filled with tourists and feels a bit too western for me. The second advantage is the beach. Unfortunately, the beaches in Mui Ne are disappearing into the ocean. 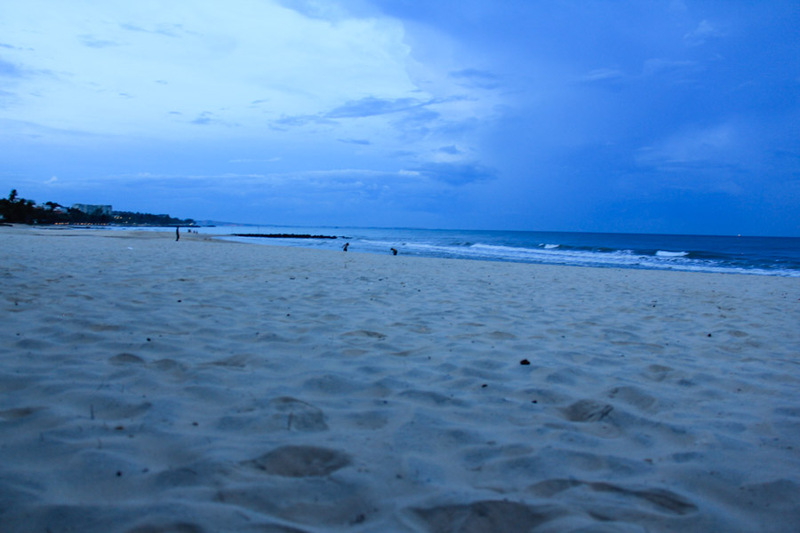 Erosion has taken away many of the resort’s beaches. If you want a nice big hunk of sand that’s inviting, go west. The beaches in the west are much larger and more beautiful. Our main activities in Mui Ne included: opening beer, picking up beer, drinking beer, setting beer down, looking at ocean, going to store to buy more beer. When we finally decided to spend a day out, it was a good one. We drove a loop around the area (see map below), making a few stops along the way. The first being the Fairy Stream. When Sara first proposed that we go to the Fairy Stream, I was a bit reluctant. Perhaps, it was because she said something about how she was going to leave me there with the other fairies. Now, I know I’m not a fairy, but I didn’t know if the other fairies would realize this. Luckily, there are no actual fairies at the Fairy Stream. Instead, it’s filled with beautiful landscape. For about an hour, we walked in the ankle-deep creek passing by jungle, red sand hills, ostrich-riding pens, and lots of beautiful colors. It was a great experience, like no other walk I’ve ever been on. After that, we cruised along the road stopping at anything remotely interesting. This included: fish drying in the sun, woman working in the fields, and amazing views of the ocean. The newly constructed road that runs parallel to the main beach road is a very easy ride with hardly any traffic and some great stretches of beauty. The loop is certainly worth the hour and a half that it took. That night, we went to Tropical mini-golf and took on their nearly impossible course. For 120,000 VND each you get 1 beer and 18 holes of challenge. Of course, we made a bit of a drinking game out of it, so in the end we were both winners. There are quite a few international restaurants in Mui Ne. You can get Indian Food at Ganesh Indian Restaurant (400,000 for a feast of 2 curries, rice, a plate of vegetable pakoras, and 2 mango lassi), Mexican food with El Latino (340,000 for a couple plates of tacos and 2 mojitos), pizza with Good Morning Vietnam (140,000 for a medium), or even German with the popular microbrewery Hoa Vien. That being said, the best food in Mui Ne comes from the ocean. There are a number of restaurants along the shore that say “Bo Ke” on them. They serve up fresh seafood for great prices. Every time we drove by the stretch of them, only one was open (we never went at night though): Mr. Crab. We ended up going there twice, and regretted not coming back a third time. 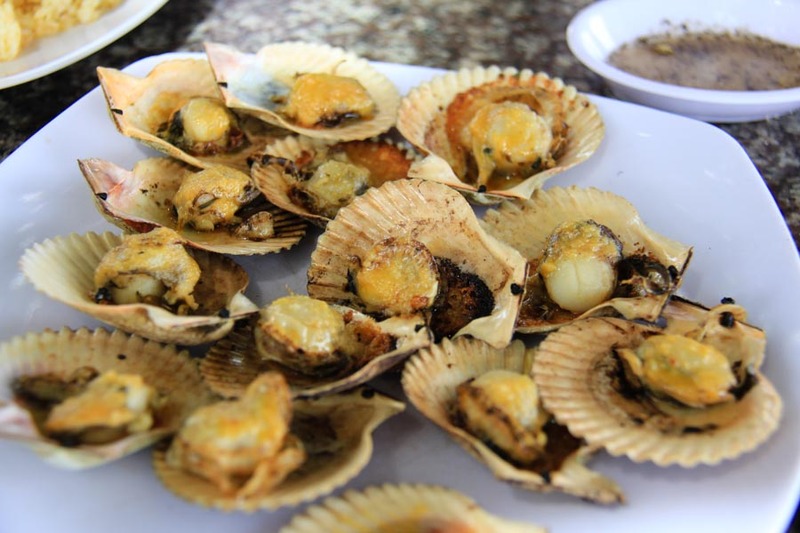 The scallops were the highlight, and only 40,000 VND ($2) for a plate. The tamarind shrimp was also very good. As was the fried rice noodles with seafood. An example of a bill there: butter garlic scallops, seafood salad, and salted fish fried rice for 205,000 VND ($9). I almost forgot to mention, the view from the restaurant is great. You can watch the boats, listen to the waves, and basically sum up all of Mui Ne in one delicious meal. A $2 plate of fresh scallops with butter and garlic. Most people come from Saigon via a 5-or-so hour bus ride. There are a few companies that do it. FUTA Bus can be arranged from the backpacker district. They have two offices around Pham Ngu Lao and De Tham. You have to go to the one on De Tham to book the bus to Mui Ne. You can also book it online. If you prefer, they also have a bus that leaves from Mien Dong bus station. The best time to leave is 7:30AM, as the traffic is lighter and you’ll get there right around the time you’ll be allowed to check in to your hotel. The cost is 135,000 VND each and it took us 5.5 hours. The best part: they will drop you off on the main road, as close to your hotel as possible. No taxis, no long walks in the sun. If you’re heading back to Saigon, FUTA buses leave throughout the day and night from 20 Huỳnh Thúc Kháng (on map below). Exact times can be seen on their website. You’ll have to pick your destinations (Mui Ne is under Phan Thiet) and fill in some details before they show you the schedule. If you are going to or coming from Nha Trang, Sinh Tourist will pick/drop you off at their Mui Ne office (on the map). The cost is about 79,000 leaving Mui Ne at 1:00PM and arriving at about 6:00PM. From Nha Trang, it leaves at 7:45AM. The bus office in Nha Trang is at 90C Hùng Vương. There are other companies that do this trip (ex. Tam Hanh Travel – 14A Tran Hung Dao), so you can shop around by walking the tourist areas and popping into travel agencies. You can also go to, or come from, Da Lat — 5 hours, about $10. Sinh Tourist makes this trip for 100,000 VND departing both Da Lat and Mui Ne at 7:30AM or 1:00PM. The train goes to Phan Thiet, which is about a 150,000 VND taxi ride to/from Mui Ne. There is also a much cheaper number 9 red bus that runs from the road outside of the train station and stops various points along the main road in Mui Né. It leaves every 20 minutes from 5:30AM until 8:00PM. A ticket on the train is 188,000. It leaves Saigon at 6:40AM or 5:40PM, and leaves Mui Ne at 1:10PM or 10:55PM. The trip takes about 4 hours. You can check times and availability here. If you’re satisfied with just a nice pool, I’d say the rooms at Bien Nho Resort are a great buy, but only if you can negotiate them down to 300-400,000 per room, which we managed to do back in 2012. If you just want a clean place to crash, where you can get some sleep, relax on a hammock, and be close to the action Cocosand Hotel has nice bungalows that will meet all these requirements for only $15/night. If you want to splurge, Phu Hai Resort is a great option. You should be able to get a room for about $45/night. You’ll be able to enjoy their massive beach, massive pool, and massive breakfast. Mr. Crab, that’s the name, that name again is Mr. Crab. Along the coast, just outside of the tourist district, is a row of bờ kè restaurants. Bo ke, translates to embankment. Presumably, these restaurants are called that because they are right on the edge of land that hugs the rough waters of the South China Sea. Many of the restaurants have closed (apparently, they were illegal), but Mr. Crab remains open and prosperous. 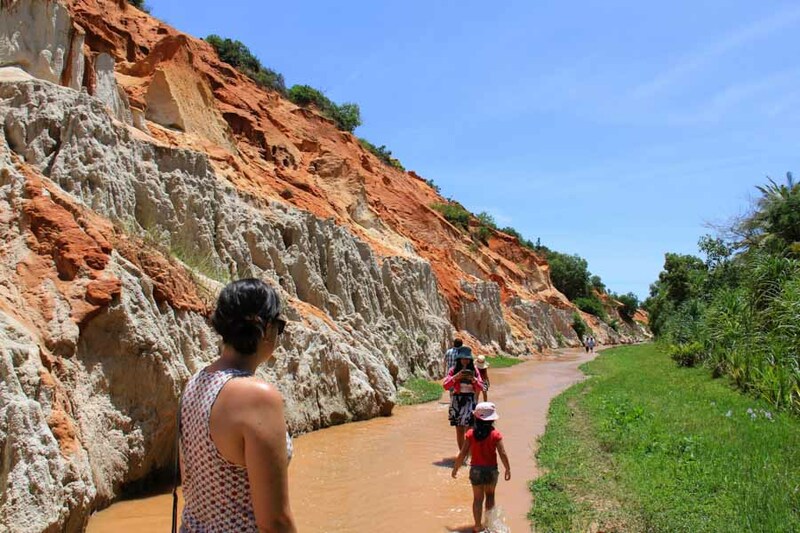 We went there twice while in Mui Ne. The seafood is cheap and cooked to perfection. 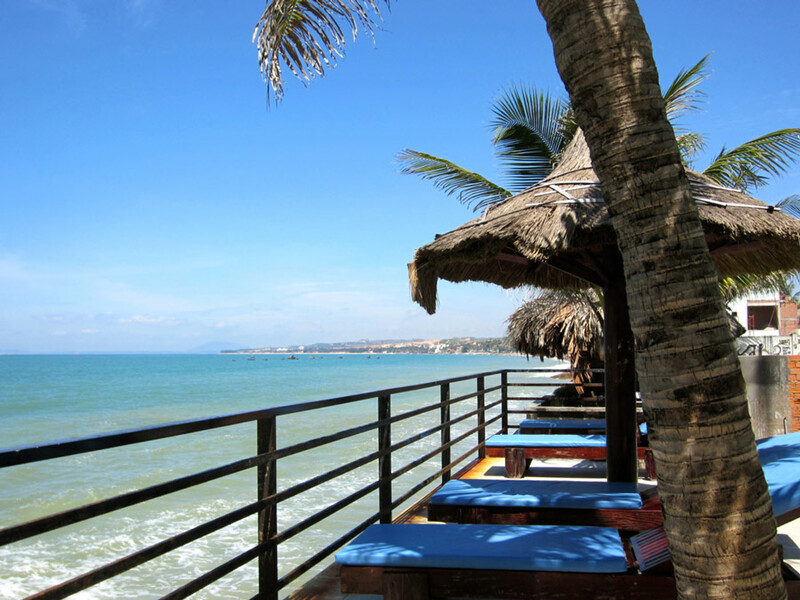 This is the best spot to try seafood in Mui Ne. That name again, is Mr. Crab. A Sinh Tourist bus leaves from their Mui Ne office at 1:00PM for Nha Trang. The cost is about 79,000. It arrives at about 6:00PM. There are other options to Nha Trang. Try popping in to the tourist offices around town to see what you can find.